I had heard mixed reviews about this book from parents. Those who loved it always grinned at the mention of it. “Ten apples up on top” was the first one I picked up. Both Junior and I fell in love with it. 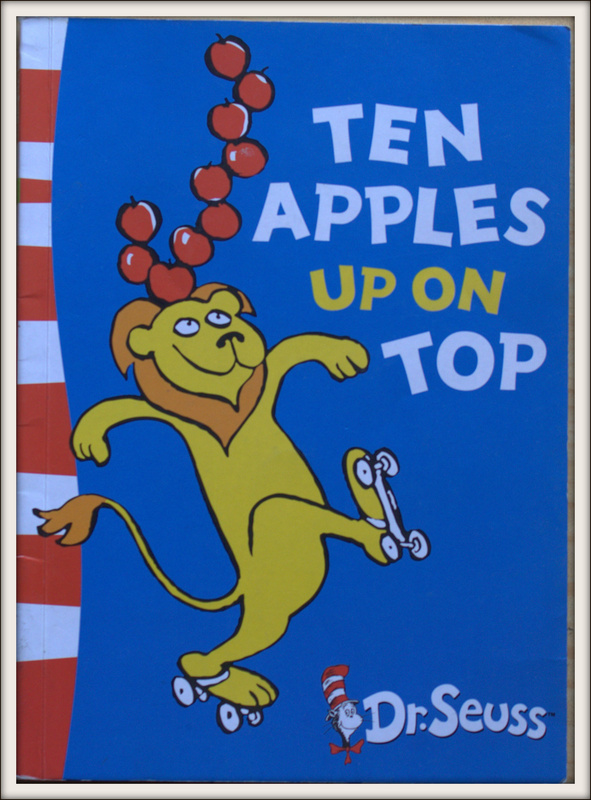 It’s about a lion, dog and tiger that show off how many apples they can balance on their heads as they skip, climb trees, tight rope walk and skate. The story is full of action and excitement which had Junior rolling with laughter. “ You can do three or “And now, see here. But I can do more. Eight ! Eight on top ! You have three Eight apples up! The illustrations compliment the fun part very well. Junior read and re read it every day with lot of joy. 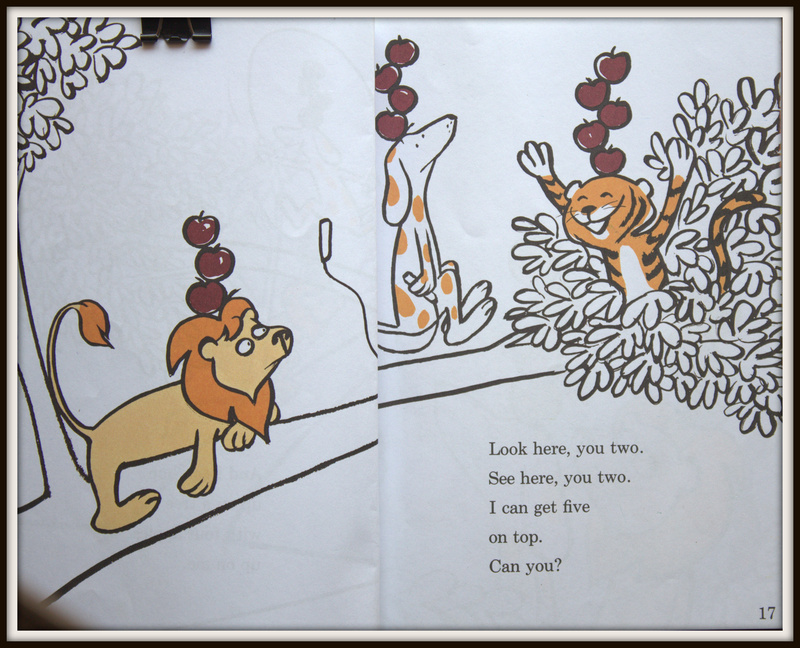 There are three categories of books – Green back is for the beginners , ‘Ten apples up on top ‘ can be tried as first read. Please visit http://www.seussville.com/ for more. - Ask your child to draw his picture. Ask him to draw as many apples he wants on his head. After the drawing is over both of you count the apples and write “……… has ……… number of apples on his head”. Display it proudly on the fridge for all to see. - This activity requires some pre-work. Draw and cut out of at least 10 numbers apples. Keep a strip of long stiff paper and glue handy. Ask your child to stick as many apples cut- outs he wants on the strip. Stick this strip on your child’s head band. Now he can pretend to be the lion himself. - Ask your child to bring his favorite toys – cars etc. Ask him to place the apple cut-outs beside the toys starting from one end. Both of you count aloud the number of apples required to cover the whole length of the car. A nice way to introduce the concept of length measurement to the little one. - During playtime you and your child can have a ‘highest tower’ contest with building blocks. All along make sure both of you count loudly.